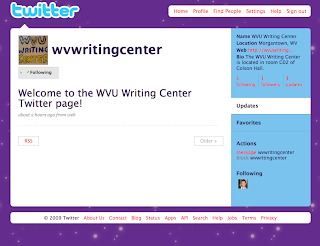 WVU Writing Center Blog: Writing Center on Twitter! In an effort to be more interactive with the online community, the WVU Writing Center is now on Twitter! Set up an account and follow us for all the news, promotions, contests, and information you need regarding your campus Writing Center!